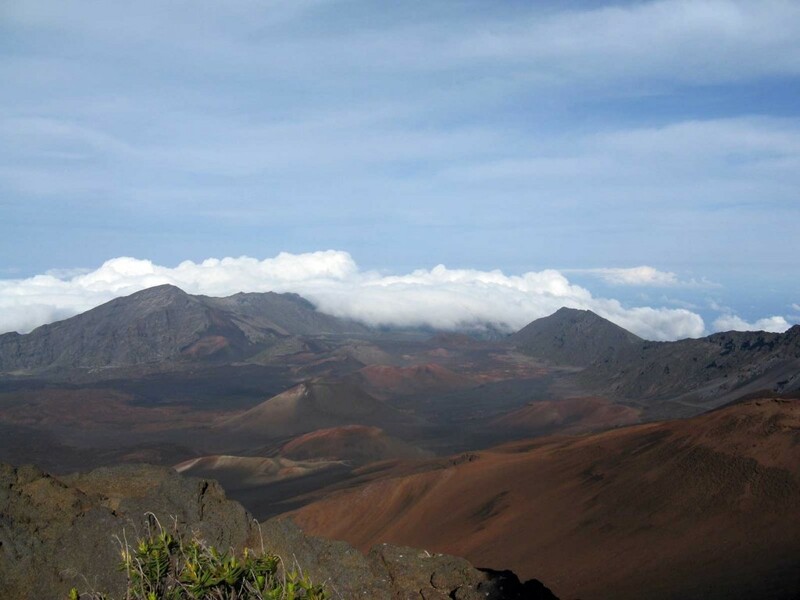 A short distance from Maui’s warm beaches, the peak of the island tops out at over 10,000 feet on the mountain of Haleakala. Up here the air is thin, the temperature is cold, and the landscape is barren. The differences are so extreme from a typical view of Maui that many people question the origin of photos taken here. Although it looks like a volcano, this photo looking to the northeast actually captures several cinder cones inside of an immense erosion zone. The cinder cones formed from volcanic activity, solidified harder than the ground around them, and were left standing as everything else washed away by rain and wind. Haleakala means, ‘house of the sun,’ which is fitting as the sunrise comes up directly behind these peaks.